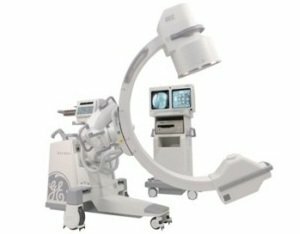 Available as late as October 2011 in the US, the GE OEC 9800 Plus c-arm has been in service in more healthcare centers around the world than any other mobile unit. It is designed to last longer with a rotating anode; patented battery buffer technology; and quality locks, levers, and controls that are built for years of use. Its point-and-shoot ease of use has made it a classic, with the SmartView pivot joint which allows the C-arm to move off-axis into the exact position and angle required. It has a compact size for use in the smallest settings and dual-side controls to allow operation from either side. It possesses OEC technology to provide the highest quality images: SmartMetal adjusts settings to improve image quality when metals are introduced to the field, SmartWindow senses the collimator’s position, and AutoTrak detects anatomy to stabilize the image even when the subject is moving. The number of facilities using this unit is testament to its usefulness and serviceability. Buy a used GE OEC 9800 Plus and join their ranks. It is available for sale here, as a refurbished unit, helping to bring your clinic or theater at par with the rest of the world – at a low price! I want a free price quote on the GE OEC 9800 Plus, send it today!